In light of the recent RealityCapture move to add native Sketchfab exporting, we saw a growing number of high resolution 3D scans made with it and wanted to take a closer look at this amazing photogrammetry tool. For those unfamiliar with it, RealityCapture is a 3D modeling and mapping software. 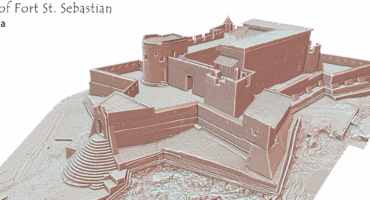 It automatically extracts beautiful and accurate 3D models from an unordered set of images and/or laser scans. It is unique in every aspect. With its rich easy-to-use UI, extremely fast state-of-the-art core and with a set of unique features, it pushes the envelope of what can be done with the photogrammetric methods. As photogrammetry grows as a way to showcase content in a powerful way, there are a few tools that really take it to the next level. A few of our 3D scanning enthusiasts share why RealityCapture is their go-to tool. We are Human Engine and we specialize in interactive media, computer vision and artificial intelligence. We do 3D scanning, plus 3D content and character creation. We also develop interactive applications like Virtual Reality (VR) and Augmented Reality (AR) experiences, PC games, Mobile Apps, and many others. We are based in Los Angeles, CA and we also have a team in Manila, Philippines. RealityCapture has been an essential tool for our 3D content creation pipeline since we use it to create most of our assets for our clients and for our products, as well as for our VR experiences and AR apps. Just recently, we released Figure Anatomy on Apple App Store. It is an app showcasing our meshes created using RealityCapture and is a great reference for character drawing, catered for beginners and experienced artists. You can check the app’s website for more information: figureanatomy.com. We also have an upcoming app, Minute Pose, which is a reference app for yoga poses. We really like RealityCapture since it does a great job on things we need for our products and services (i.e. processing character scans); from amazing detail of the models to the fast processing time, we can do a lot of awesome work in a given timeline. For example, in our Figure Anatomy app, we’ve dealt with a number of scans to create, and speed is a crucial factor for our development. RealityCapture helped deliver things on time. In terms of the quality of the scans, it’s superb. We are getting very good alignment. Reconstructed meshes are not just accurate, they also have incredible amount of details. These are very helpful as some of our projects and apps require getting close or zooming in those meshes and checking their details (e.g. skin details for characters). My name is Abby Crawford and I am a freelance 3D scanner and Sketchfab Master. Lately the majority of my 3D work has been done for the Santa Cruz Museum of Art and History (MAH), which houses a large collection of art and artifacts from Santa Cruz, California and surrounding areas. Sometimes the objects that I’m modeling are easy to capture (old, rusty pots, for instance), but just as often I’m trying to produce models of shiny or oddly shaped objects that present point-matching challenges. I am also typically trying to capture all sides of the objects I shoot, including their bases. This approach frequently complicates my workflow. I have recently been working with Capturing Reality’s RealityCapture and have been so pleased with the software’s ease of use, processing speed, and model accuracy. The more I work with RealityCapture, the more I like it. The subject of this first model is The Yellow Kimono, a teapot by Pam Murakami in the collections of the MAH. It is a glazed ceramic piece that reflected light from both the skylight above and the fluorescent lights all around the museum’s archives room, where I took the photos. I shot a series of photos with the vessel upright, and then on each of its sides so that I could capture the bottom and the feet of the object. The way that photo alignment works in RealityCapture, I was able to just throw all of my photos in and hit the “align” button. Miraculously, all but nine of the photos aligned properly and quickly. The spout of the teapot came out so cleanly, despite all the shiny spots in the photos, and the curves of the spout’s opening. The software had a little bit of trouble with the handle of the tiny teapot on the lid of the larger teapot, but that problem is minor when compared with the problems that could have arisen from various shine problems. I filled the hole on the end of the handle in Autodesk ReMake. It’s a little bit choppy, but not terrible. Overall, this model took just over an hour to process in RealityCapture. My name is Vladlen (Vlad). I’m originally from Russia and for the last 4 years, I have lived in Japan and worked as UI/UX designer in Japanese game developer company. I have about 20 years experience in design, from DTP, Advertising, Branding, and 5-6 years UI/UX mobile design, and Adobe Certified Expert. To check out the comprehensive breadth of my work, check out my design portfolio. Along the way, Sketchfab’s community has helped me find photogrammetry. At first, I created rough meshes but now create precise sub-millimeter resolution models from just simple photos. So in the last few years, photogrammetry and 3D Scanning have become my main hobby. At the moment, RealityCapture has become the Number One photogrammetry tool that allows maximum capacity reconstruction in real details (3-10 time more comparing to other tools). Not only is this resolution possible, I did this at an amazing speed on simple Intel i7 processor and not a new and expensive Nvidia GTX video card, without hundreds of gigabytes of RAM. At its lowest requirements, RealityCapture can calculate any size mesh with just 16Gb of RAM, and can align 1000 images in minutes! The combination of powerful code, speed, and memory optimisation made by RealityCapture developers is easy to see in big projects when RC can align 100,000 images in matter of days and on one machine. This just has not been possible with other photogrammetry tools that I have used, in regards to huge projects requiring Tb of RAM and cluster based systems. Accounting for all this, I just see no other choice than RealityCapture if you need speed and quality. Public Art Services creates 3D content of cultural heritage and public art that is available across all media. Our experience is based on over 40 years of graphic reproduction as qualified Photo Lithographers and pioneers of digital photo retouching in the UK. Our mission is to provide an experience that not only replicates the artist’s work, but also enhances how people can interact with it by telling the story of the art across media platforms such as augmented reality, VR and print. Our company have researched “structure from motion” for nearly 6 years, creating over 2000 captures, and we were proud to have been continuously showcased on the Microsoft Photosynth website. When Microsoft decided to close the project we had to find a better alternative to not only continue our mission, but to also create a process that would not become redundant. Throughout this research we found that we were able to quickly dismiss solutions that did not meet our requirements, until we found the best product for our purpose. We currently capture cultural heritage and public art at 25 megabytes per frame and depending upon the subject, we can end up taking over 300 images. We do expect to have requirements for much higher resolution in our projections for the second phase of our business plan. This is mentioned here, as our need for photogrammetry software meant being able to handle many gigabytes of data with both speed and affordability. RealityCapture is in our opinion, without doubt the best solution for advanced users who want to produce the highest quality captures. All our models on Sketchfab have been created using this software. We have been working with it for over a year now and although still in Beta it has surpassed our expectations, a truly fantastic tool that will only get better as it matures. RealityCapture are currently running a promotional license for 99 Euros for 3 months use and we usually run 3 licenses across 3 machines to increase our throughput. RealityCapture is our choice of photogrammetry software for our business and we have great expectations for the continued development of one of the best software solutions we have ever worked with. We definitely look forward to continuing our journey with such an innovative company. Public Art Services would not exist without RealityCapture and the home for our 3D content, Sketchfab. As good as any software is, the online service the platform provides us with is unique. The ability to use the Sketchfab post production suite enables us to take our models to a new level, the enhancements and corrections that can be made are simply first class and unobtainable elsewhere. We really can’t wait to be a part of the next generation of 3D! how do I do a similar thing with my webcamera? I would liek to scan some parts of my body.